Web browsers have been around for a long time. From AOL to Internet Explorer, there have been many versions of them. There is definitely a top group of browsers followed by some more minor ones. IE, Firefox and Google Chrome seem to be the big three right now. Apple’s Safari is not far behind because it is the default browser in their devices. Internet Explorer (IE) has been around the longest and is the default web browser for most PCs. IE has gained a bad rap over the years, but with the release of IE 9 they have really fixed a lot of short comings of their previous versions. Mozilla Firefox is another great browser. What I really like are the plugins, especially the web developer one, a very handy tool, and people really like the ad blocker plugin as well. Google Chrome is the youngest browser, but it is catching up very quickly. It boast very fast load times and they are starting to integrate games and shopping into their browser along with other features. Really you cannot go wrong with any of them, they all function very similar to one another and really comes down to personal taste. The only browser I would not recommend is the AOL browser. It is based on an earlier version of IE and has a lot of quirks and bugs to work out. One of the biggest questions I get from clients, is why don’t this application work or why won’t this page work? The reason is they never update their browser. Now I know some businesses forbid people from doing this at work, but there is no reason a home user should not be up-to-date. Even large companies like Google will not support older browsers with their pages, a warning will show on the page to up date your browser for the page to function properly. So no matter what browser you choose, make sure to keep it up-to-date with the latest version. 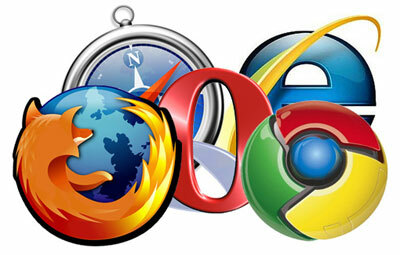 So what are your thoughts on web browsers and what are your favorite ones?